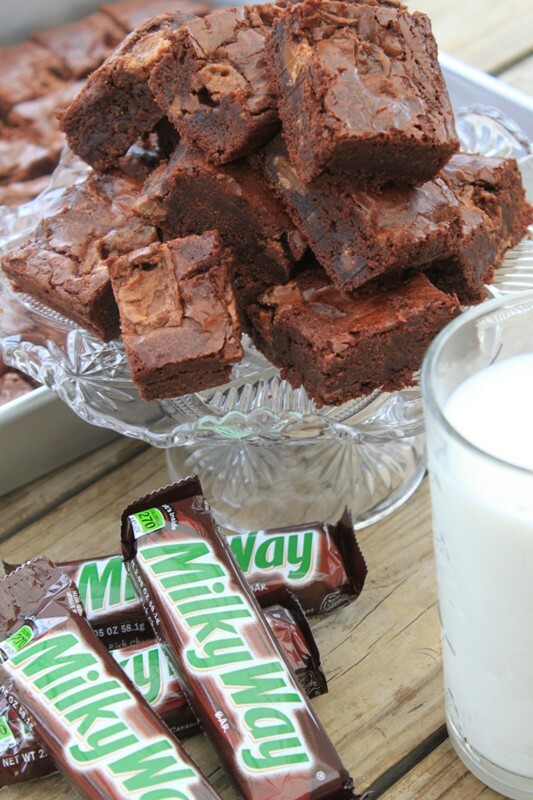 MilkyWay Brownies | Rosetta Bakes! First of all, how many different kinds of brownie recipes are out there? It’s endless! I love a good brownie with a large glass of milk! I love a warm brownie topped with vanilla ice-cream! I love a brownie just about anyway you make them, it’s just so darn hard to decide which one to choose when you want to make brownies! I think this brownie ranks right up there with one of the best I’ve had. This brownie is so rich with chocolate, and then there’s the MilkyWay bar with it ooey gooey goodness scattered throughout, and then there’s the coffee! I warn you, you’ll have to get a large glass of milk when having ONE of these brownies! 1. Preheat oven to 350°F. Butter and flour 12x18x1-inch pan. Line with foil or parchment that hangs over the sides for ease in getting them out (butter the foil/parchment). 2. In a heat-proof, medium-bowl set over a saucepan of simmering water, heat butter, and chocolates until melted and smooth; cool slightly. 3. In a large bowl, whisk together the eggs, espresso powder, vanilla and sugar. Stir the egg mixture into the slightly cooled chocolate mixture. Cool to room temperature. 4. In a medium bowl, sift together flour, baking powder, and salt, then add to batter. Stir chopped mini MilkyWay bars into chocolate mixture. Then pour into prepared baking pan and smooth top with a rubber spatula. 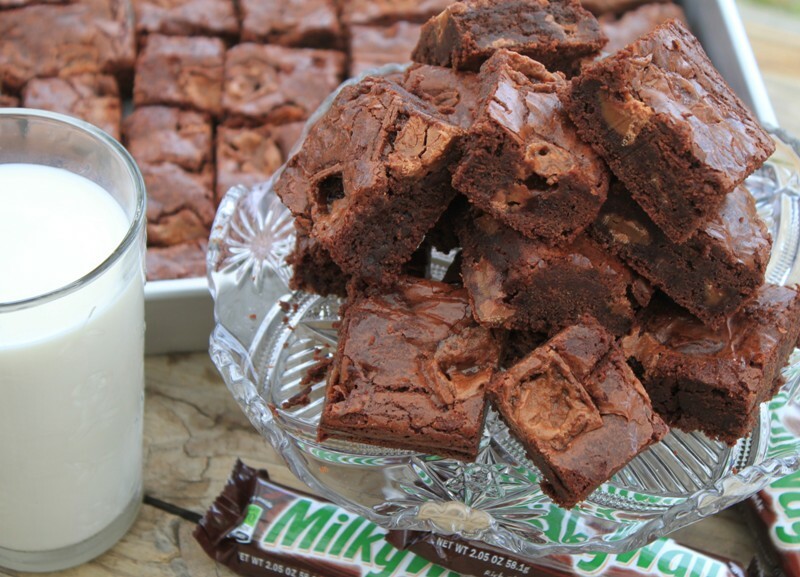 Place slices of the full-size Milky Way Bar onto the top of the brownie batter. 5. Bake for 25 to 35 minutes, or until toothpick inserted in center comes out clean with a few crumbs attached; do not over bake! Let cool completely, then cover tightly and chill overnight. Chilled brownies are easier to cut.